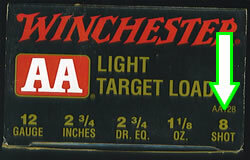 Most shotgun shells are constructed of a plastic casing with a brass or aluminum covering at the bottom of the shell. The brass or aluminum covering can be short or long. A short covering will indicated a low power shot while a long covering indicates a high power shot. Inside of the shell starting from the bottom is the primer. Next, you will find the powder, then wadding and finally the shot. The wadding can be three separate pieces or one whole piece. The purpose of the wadding is to act as a propellant for the shot. If there were no wadding, the pressure created from the powder would be expelled through the shot as opposed to propelling the shot itself. In three piece wadding the first part is the powder wad. This acts as a seal and is placed over the powder. The next part of the wadding is the cushion. It acts as a shock absorber to absorb some of the impact and keep the shot from deforming. The shot cup is the third piece and its purpose is to hold the shot together as it moves down the barrel. Upon exiting the barrel the shot cup peels open allowing the shot to continue undisturbed. A one piece wadding accomplishes the same thing, it just happens to be one piece. 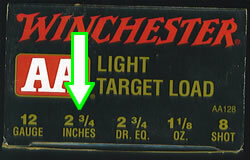 When determining what shotgun shell to purchase, the first thing you must select is the correct gauge size. 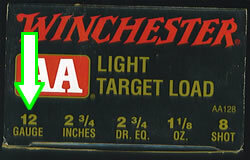 Some common gauge sizes are 10, 12, 16, 20, 28, and 410 with the most popular being the 12 and 20. It is very important to match the correct shell with your gun. Your next choice should be the drams equivalent (DR. EQ). Drams equivalent indicates the amount of powder that is used to propel the shot from the barrel. A “dram” is a measurement of black powder. When you see “2 3/4 DR EQ” on a box of shells, you’re seeing how much smokeless powder is used to produce the same velocity as 3 drams of black powder. Smokeless powder is measured in “grains”. 1000 grains = 1 pound where as 256 drams = 1 pound. Smokeless powder is much more explosive than black powder, therefore when using smokeless powder, less powder is needed. Some common sizes that you will see are 2 ¾ and 3. You may also find 2 ½ through 3 ¾. The higher the number of dram, the faster the shot travels. This also means that, the higher the number, the harder the gun will kick. Sometimes the manufactures will display the FPS (Feet Per Second) indicating how fast the shot actually travels. 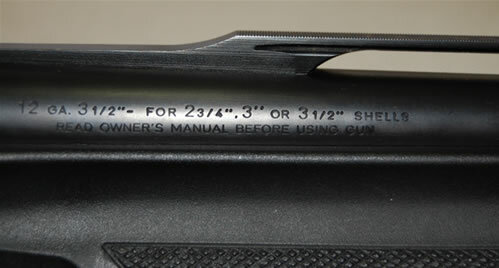 For example, a 12 gauge shell will usually range from 1000 – 1400 FPS. Another decision that must be made is the quantity of shot that you want within each shell. This is measured in ounces. 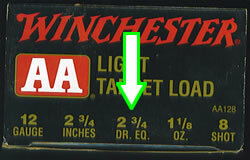 For example, a 12 gauge shell will range from 7/8 to 2 ¼ ounce of shot. Obviously the higher the number, the more shot the shell contains. And your final decision is the shot size. This is determined by what you are going to be shooting. 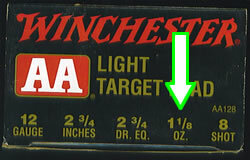 The smaller the shot number is the larger the bb will be. The larger the bb, the more power it sustains over a longer distance. Here are a few examples of what size shot you should use when hunting a specific game with lead shot.